The retail giant’s online-education deal puts American Public University on the map, but some experts say other options might better serve low-paid workers. There might have been a Wal-Mart University. As the world’s largest retailer weighed its options for making a big splash in education, executives told one potential academic partner that Wal-Mart Stores was considering buying a university or starting its own. “Wal-Mart U.” never happened. Instead, the retailer chose a third option: a landmark alliance that will make a little-known for-profit institution, American Public University, the favored online-education provider to Wal-Mart’s 1.4 million workers in the United States. Adult-learning leaders praise Wal-Mart, the nation’s largest private employer, for investing in education. But some of those same experts wonder how low-paid workers will be able to afford the cost of a degree from the private Web-based university the company selected as a partner, and why Wal-Mart chose American Public when community-college options might be cheaper. They also question how easily workers will be able to transfer APU credits to other colleges, given that the university plans to count significant amounts of Wal-Mart job training and experience as academic credit toward its degrees. For example, cashiers with one year’s experience could get six credits for an American Public class called “Customer Relations,” provided they received an “on target” or “above target” on their last performance evaluation, said Deisha Galberth, a Wal-Mart spokeswoman. A department manager’s training and experience could be worth 24 credit hours toward courses like retail ethics, organizational fundamentals, or human-resource fundamentals, she said. Altogether, employees could earn up to 45 percent of the credit for an associate or bachelor’s degree at APU “based on what they have learned in their career at Wal-Mart,” according to the retailer’s Web site. Janet K. Poley, president of the American Distance Education Consortium, points out that this arrangement could saddle Wal-Mart employees with a “nontransferable coupon,” as one blogger has described it. 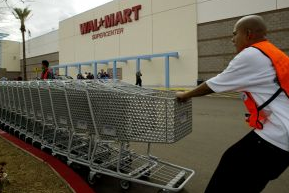 “I now see where the ‘trick’ is—if a person gets credit for Wal-Mart courses and Wal-Mart work, they aren’t likely to be able to transfer those to much of anyplace else,” Ms. Poley wrote in an e-mail to The Chronicle. Transferability could be important, given the high turnover rate in the retail industry. Wal-Mart screened 81 colleges before signing its deal with American Public University. One that talked extensively with the retailer was University of Maryland University College, a 94,000-student state institution that is a national leader in online education. According to University College’s president, Susan C. Aldridge, it was during early discussions that Wal-Mart executives told her the company was considering whether it should buy a college or create its own college. When asked to confirm that, Ms. Galberth said only that Wal-Mart “brainstormed every possible option for providing our associates with a convenient and affordable way to attend college while working at Wal-Mart and Sam’s Club,” which is also owned by Wal-Mart Stores. “We chose to partner with APU to reach this goal. We have no plans to purchase a brick-and-mortar university or enter the online education business,” she said. The Wal-Mart deal was something of a coming-out party for American Public University. The institution is part of a 70,000-student system that also includes American Military University and that largely enrolls active-duty military personnel. As American Public turned its attention to luring the retail behemoth, it was apparently able to be more flexible than other colleges and willing to “go the extra mile” to accommodate Wal-Mart, said Jeffrey M. Silber, a stock analyst and managing director of BMO Capital Markets. That flexibility included customizing programs. APU has a management degree with courses in retail, and its deans worked with Wal-Mart to add more courses to build a retail concentration, said Wallace E. Boston, the system’s president and chief executive. It also enticed Wal-Mart with a stable technology platform; tuition prices that don’t vary across state lines, as they do for public colleges; and online degrees in fields that would be attractive to workers, like transportation logistics. Unlike American Public, Maryland’s University College would not put a deep discount on the table. Credit for Wal-Mart work was also an issue, Ms. Aldridge said. Affordable on $12 An Hour? Then there’s the question of whether low-wage workers will be able to afford the degrees. One of the key features of this deal is the discount that Wal-Mart negotiated with American Public. “Wal-Mart is bringing the same procurement policies to education that it brings to toothpaste,” said John F. Ebersole, president of Excelsior College, a distance-learning institution based in New York. American Public University’s tuition was already cheap by for-profit standards and competitive with other nonprofit college options. It agreed to go even cheaper for Wal-Mart, offering grants equal to 15 percent of tuition for the company’s workers. Those employees will pay about $11,700 for an associate degree and $24,000 for a bachelor’s degree. But several experts pointed out that public colleges might provide a more affordable option. The Western Association of Food Chains, for example, has a partnership with 135 community colleges in the western United States to offer an associate degree in retail management completely online, Ms. Tate said. Many of the colleges also grant credit for prior learning. Though the tuition varies by state, the average tuition cost to earn the degree is about $4,500, she said. By contrast, she said, the American Public degree is “really expensive” for a front-line worker who might make $12 an hour. Alicia Ledlie, the senior director at Wal-Mart who has been shepherding this effort, told The Chronicle in an e-mail that the company is “right now working through the design of those programs and how they will benefit associates,” with more details to be released later this summer. One thing is clear: The deal has a big financial impact on American Public. Wal-Mart estimates that about 700,000 of its 1.4 million American employees lack a college degree. Sara Martinez Tucker, a former under secretary of education who is now on Wal-Mart’s external advisory council, suggests 10 or 15 percent of Wal-Mart associates could sign up.